First steps first, the number one rule when you make a good pie dough is to keep it cold, keep it cold, keep it cold. The longer you can have your dough in a cool place (up to a point, of course) the better. This is a big reason I constantly have pie dough in my freezer, that and the fact that I just really love pie. So, keeping that in mind, cut your butter into little squares then put the squares in the freezer while you mix your dry ingredients. I, personally, like to put the squares into a mug. 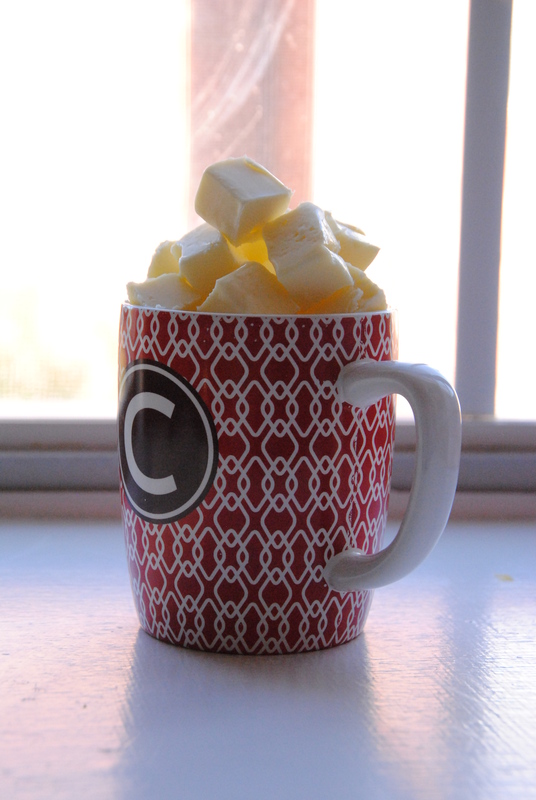 Since the mug is tall it more evenly distributes the butter and lets it cool more quickly. This particular mug was a Christmas present from my mom to my fiancé Chris. I tell you this so you don’t think I just have initial mugs hanging around our apartment; I’m just not that kind of girl. 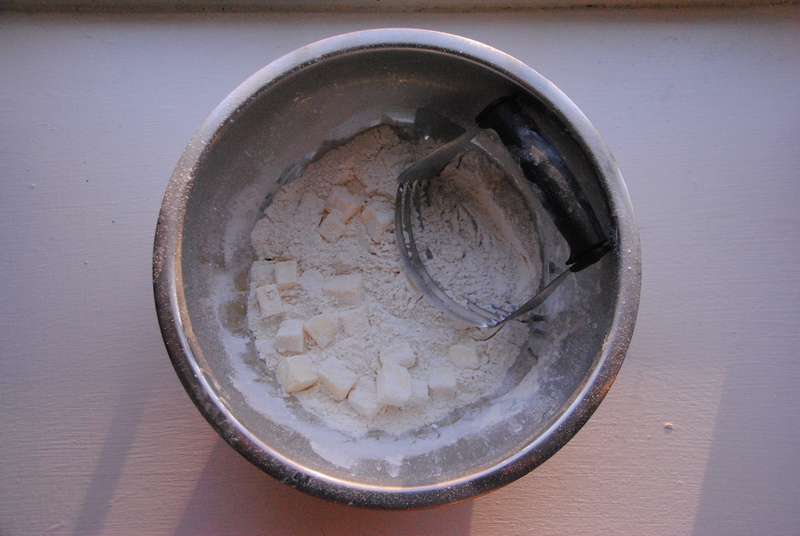 While your butter freezes for a while, mix the dry ingredients in a large, preferably metal, bowl. The metal keeps everything a mite cooler than, say, a plastic or wooden bowl. Again with the freezing, I know, but really guys, it makes for good pie dough. 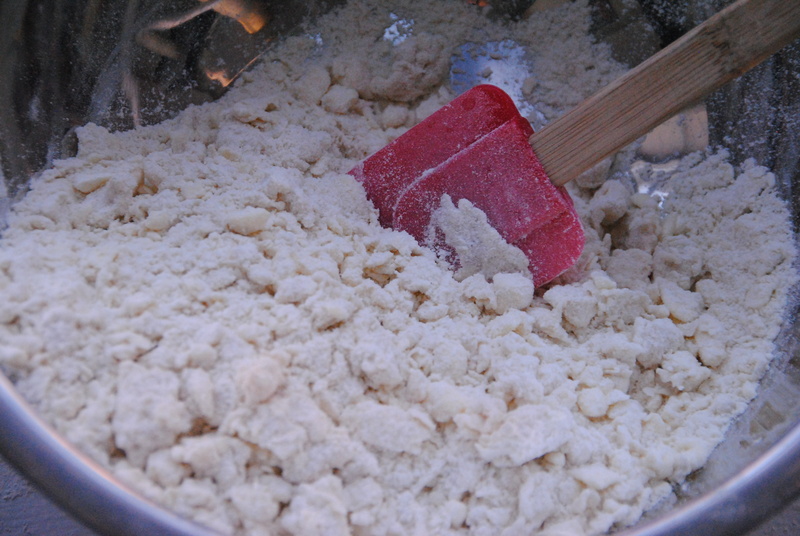 Check your butter when the dry stuff is mixed; if it’s still not hard enough stick your dry bowl in there with it and let it all sit for a few minutes. 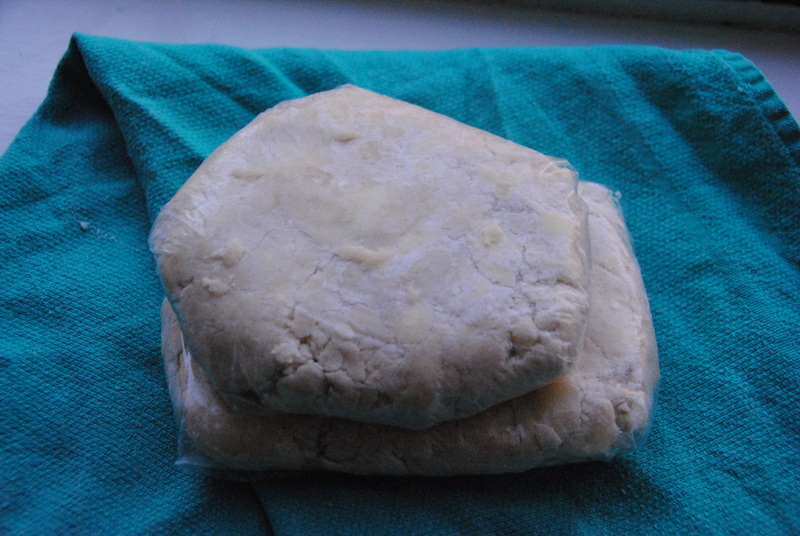 Once the butter is just about rock hard pull it and the bowl out of the freezer, put the butter in with the dry ingredients, then using either your hands or a pastry blender, cut the butter into the dough until it resembles coarse meal with the largest butter chunks resembling small peas. Once you have something that resembles the above, add a 1/2 cup of the ice water and using a rubber spatula blend it all together. Try to make sure you get every part wet so it sticks together more easily. If it still seems too dry add more water in tablespoon increments until it all seems just wet enough to hold together. 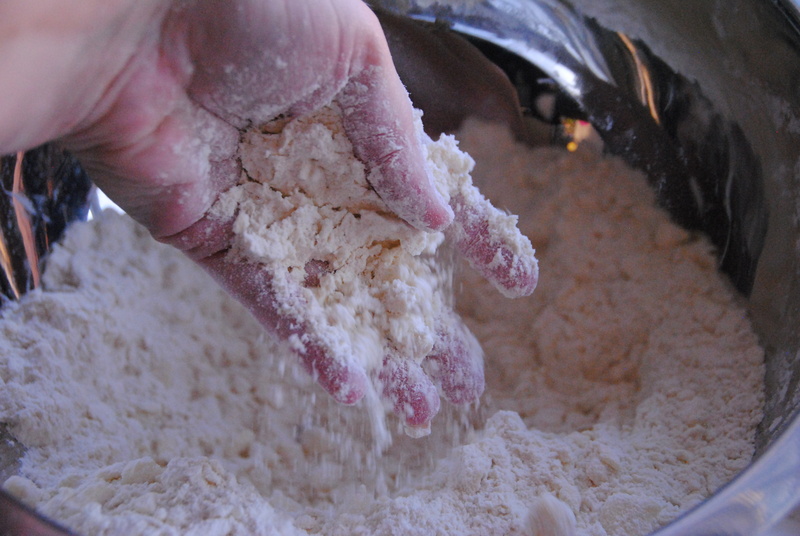 At this point dump the whole mess out on a floured counter to softly clump the dough together with your hands in two equally-sized sections. This is the hardest part for me, it never seems to stick totally together, but try your hardest to not overwork the dough or it will be tough and no longer flaky when cooked. If at any point in the mixing, dumping process you feel the butter start to melt or the dough getting too hot stick it back in the freezer for a few minutes. Once you have two coherent balls of dough wrap them individually in plastic wrap and try to flatten them into even squares. 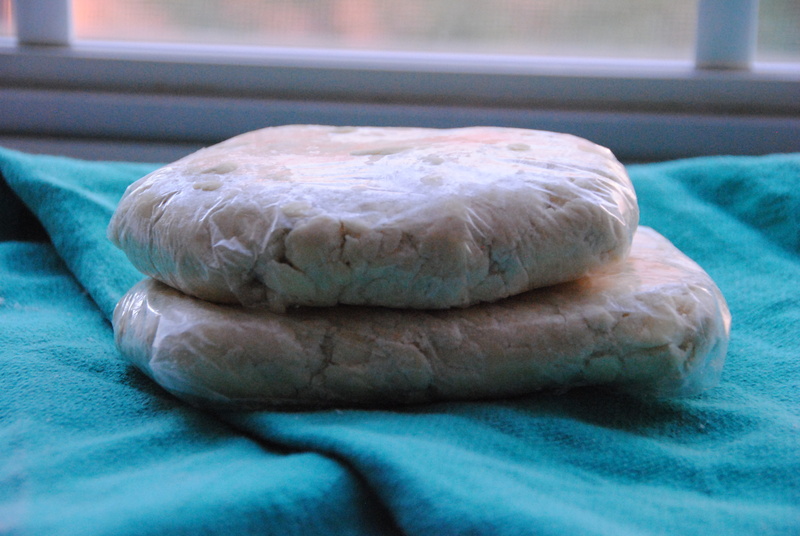 The flattening makes it easier to thaw if you have them in the freezer for a while. Refrigerate at least 30 minutes to an hour before using; you can refrigerate up to 3 days or freeze up to a month. 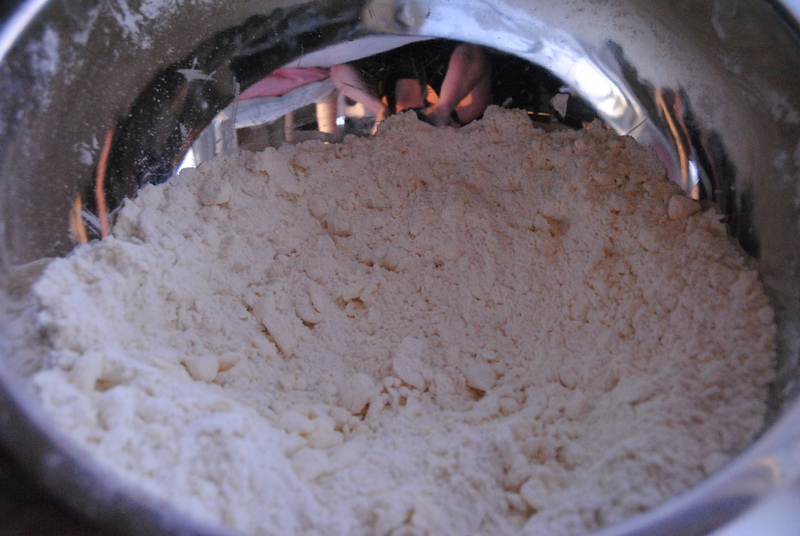 Mix the dry ingredients together then add your butter and cut it into the dry mixture using either your hands or a pastry blender until it resembles coarse meal, with the largest chunks about the size of small peas. Add 1/2 cup of the ice water and mix together using a rubber spatula, adding more water a tablespoon at a time until the dough comes together. Dump it all onto a floured counter and gently smush into two flat, evenly-sized clumps. Cover completely with plastic wrap and refrigerate at least 30 minutes to an hour before using, or refrigerate up to 3 days, freeze up to 30 days.